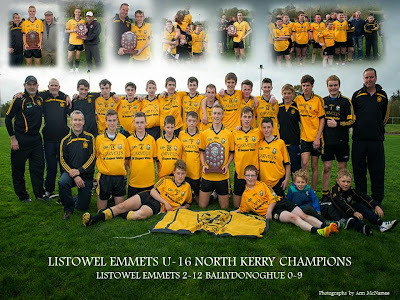 Our U-16s finished off their year in fine style on Sunday last in Finuge.Great credit to Finuge,the pitch was in perfect condition and only a strongish wind blowing into the dressing room end made conditions a bit tricky.Emmets played with the aid of the breeze in the first half and were 7pts to 3pts ahead at the small whistle(Sam Tarrant 0-05,4f, Darren Loughnane 0-01,Bryan Sweeney 0-01 ). Ballydonoghue opened the scoring in the second half and it was at this point the character of the Emmets boys was put to the test,facing into a strong breeze, they responded magnificently to a man and answered all the questions that Championship football puts to one.Feidhlim Roberts stormed into the game,picking breaks,driving forward and set up Ashley Kelliher for a great point from distance to open our second half account.Tom Melvin who never shirks responsibility turned over a great ball in their half back line which was worked to Sam Tarrant,who goaled and the energy spread through the whole squad.Some lovely scores followed,all from play-2pts from Darren Loughnane,1pt a piece from Jade Griffin and Sam Tarrant before in the final minutes, Cian McCarthy fed Kevin O Connor who played a lovely ball over the top to Jade Griffin,who covered every blade of grass on the pitch, and Jade rattled the back stantion to the delight of the large number of Emmets supporters present. Ballydonoghue added 6pts to their tally in the second half and as usual kept playing to the end and were unlucky with some goal chances and to find Conor Beasley in such fine form between the sticks.Referee John Ross who had a fine game,blew for full time and our U-16s were crowned North Kerry Champions. Every player played their part on this great day:our backs Adam Scollard,Niall Collins,Daniel Sheahan,Robert Smith,Eddie Browne,Feidhlim Roberts,Lorcan Moloney and young Micheal Kennedy were solid all through and heroic at times,Bryan Sweeney(0-01) had his usual great battle with Mitch Foley and as captain he led from the front all day and what a display by his mid-field partner,John Leahy,who had his finest hour thus far.Our forwards Jack Healy,Jade Griffin(1-01),Tom Melvin,Darren Loughnane(0-03),Sam Tarrant(1-06 4f),Oran Pierse,Ashley Kelliher(0-01),Cian McCarthy and Kevin O Connor showed a savage appetite for work all day that lifted the team and their supporters.Sheldon Neill(injury),Ciaran Pierse(injury) and John Roche(holidays) were unable to participate on the day but have contributed greatly to the win. Well done to the management team of Tommy Sweeney,Nick Roberts,Gerdie Collins,Sean Moriarty who had our boys tuned to the minute-the grit in the performance reflects well on ye. Captain Bryan Sweeney accepted the trophy on behalf of his delighted teammates and supporters and paid tribute to Ballydonoghue and thanked Listowel Celtic for their co-operation with our preparations. All in the Club are delighted for these players who have represenented the Club proudly all year. This team were beaten in a North Kerry League Final and a County League Semi-Final during the year but their application never wavered-every days end still found them on the battling line-and it's fitting to see that energy and determination rewarded with a North Kerry Championship.